The House of Commons has found the government in contempt of parliament for not releasing its legal advice on Brexit despite being instructed to do so by MPs. The result was narrow, with 311 in favour and 293 against. It is the first time a government has ever been held in contempt by parliament, and unquestionably further weakens the authority of Theresa May. The motion tabled by Labour and other opposition parties including the DUP, and debated in the chamber today, found that ministers were in contempt for failing to publish the Attorney General’s “final and full” legal advice on May’s Brexit deal. The advice is thought to be embarrassing for the Prime Minister, particularly on the sticking point of the Irish ‘backstop’. Before voting on the main motion, MPs voted down the government amendment by 311 votes to 307. This did not refute the allegation of contempt but sought to refer the matter to the privileges committee, which would then produce a report, a process that might have taken weeks. 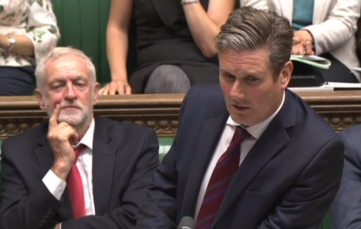 Once the results of the two votes were announced, Labour’s Keir Starmer described the situation as “unprecedented” and noted that the legal advice must now be published in full. He asked that the matter be dealt with by next Tuesday, and Speaker Bercow agreed. Leader of the House Andrea Leadsom confirmed that the government would respond promptly on Wednesday. Keir Starmer commented: “Today’s finding of contempt is a badge of shame for this government. It is of huge constitutional and political significance. Never before has the House of Commons found ministers in contempt of parliament. It is highly regrettable that the government has let it come to this, but ministers left the opposition with no option but to bring forward these proceedings.